Millions of Americans are laughing their way to the gas station. But should they be? Sure, the stunning crash in oil prices below $30 a barrel seems great for consumers because it's driven gas at the pump below $2 a gallon. And the thinking is that it should help boost the U.S. economy, with people spending their gas savings. It's rocking your retirement account: The Dow has plummeted 1,500 points so far this year and CNNMoney's Fear & Greed Index is flashing "extreme fear." You're not going to be happy when you open your 401(k) statement. The freakout on Wall Street has been largely driven by the crash in oil. It's caused energy profits to plunge and hurt stocks like Chevron (CVX) and ConocoPhillips (COP). Oil companies are dying: The U.S. energy boom was fueled by expensive drilling technology that was designed for far higher oil prices and paid for with lots of debt. Those loans are now much harder to pay off. Last year alone, 81 oil and oilfield services companies filed for bankruptcy, according to law firm Haynes and Boone. Many more are expected to succumb to financial trouble in the coming months. Big banks are bracing for losses: It's never a good sign when the country's financial lifelines are under stress. Large U.S. banks JPMorgan Chase (JPM) and Wells Fargo (WFC) that helped bankroll the energy boom are already setting aside billions to cover potential loan losses in the oil industry. High yield bonds in your investing portfolio wont be looking good either -- Standard & Poor's warned that half of all energy junk bonds are at risk of defaulting. Emerging markets are getting crushed: The oil crash raises the risk of a full-blown crisis in the emerging market world. Many economies like Brazil, Venezuela, Colombia and Russia are powered by energy exports. Brazil's longest recession since the 1930s is getting worse and Russia's currency just plunged to an all-time low. The U.S. has deep trade relations with many of these countries, and that will undoubtedly take a blow. More trouble in the Middle East: The decline in oil prices adds a new element of instability to the Middle East. Tensions are on the rise between OPEC kingpins Saudi Arabia and Iran, which can't help the already-volatile region. U.S. energy independence dealt a blow: Domestic oil output has skyrocketed in recent years, leaving the U.S. less reliant on countries in the Middle East for energy. 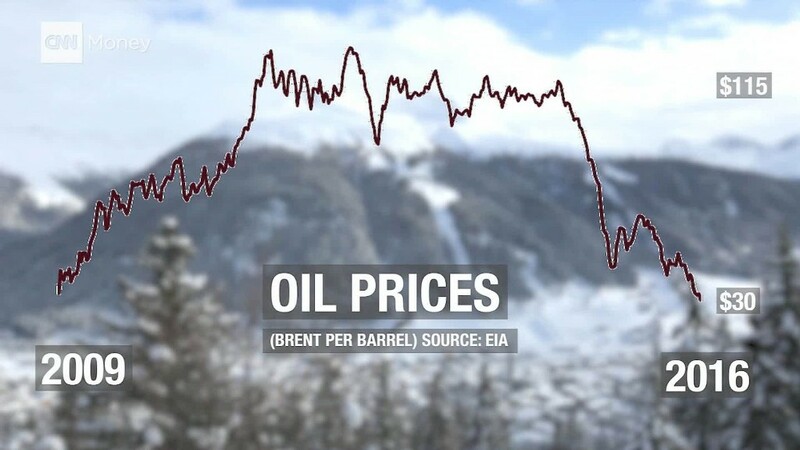 However, with some U.S. oil companies closing shop, production is now expected to decline. That's exactly what Saudi Arabia wanted when it embarked on a strategy of flat-out production that has kept prices lower than U.S. companies can survive on. Are people even spending their gas savings? The idea that cheap oil is a net positive for the U.S. hinges on the consumers spending the money they're saving at the pump. But it remains a bit of a mystery whether that's actually happening at a significant level. U.S. retail sales actually fell slightly in December despite the fact that gas prices continued to fall at the end of last year.